The Word One to One, a new resource designed to make it as easy as possible to introduce friends, family and colleagues to the Gospel, is being featured at the Evangelical Ministry Assembly today – for the first time ever. The brainchild of Richard Borgonon and William Taylor of St Helen, Bishopsgate, The Word One to One is a set of attractively-produced booklets that introduces seekers to Jesus Christ through John’s Gospel. The keys to this personal evangelism initiative are its accessibility and acceptability. It has been specially-designed for any Christian to use with contacts who have thought that one day they should take a look at the book that has sold more copies than any other, but not known how to start. Using The Word One to can take place at home, in an office or even in a coffee shop. Each booklet takes about 20 minutes to complete, so they are ideal for busy people. “And when I do use The Word One to One everyone says something like: 'WHY has no one ever shown me this before!?' Isn’t that damming of us as Christians! In our Biblically-ignorant age, most people simply do not know what the Bible actually says and what Christ promises”. 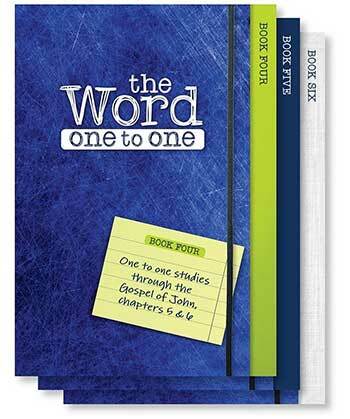 The Word One to One booklets contain everything needed to read the Bible with a friend. On the left hand page is John’s Gospel, in plain clear English, broken up into manageable chunks. In the middle section are questions and comments, which may be used in different ways – perhaps interactively, or rhetorically. And all the answers are on the right hand side, so there is no embarrassment if someone cannot get the answer. It also gives the Christian confidence in explaining what the Bible passage means.